A Visit To The National Railway Museum At York. 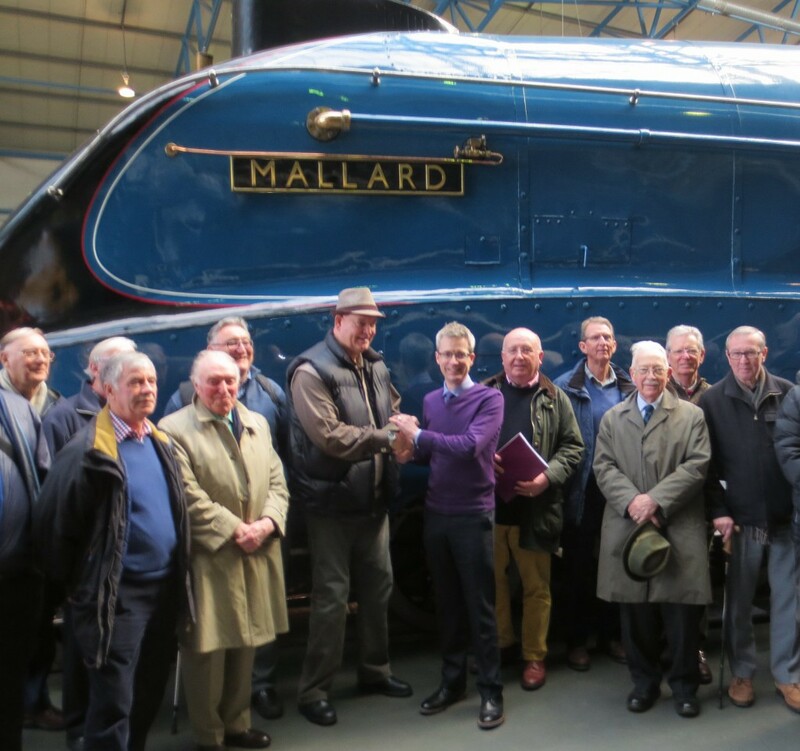 A party of 49 mem­bers and guests from Stumperlowe Probus Club enjoyed a day at the National Railway Museum in York on Wednesday, 16th March. In front of the iconic Mallard, in the Great Hall of the museum, chair­man Vince Allsopp (left) hands over a cheque for £250 on behalf of the club to Tobias Lumb, Head of Public Programmes at the NRM. Also in the pic­ture (hold­ing the folder) is club sec­ret­ary Graham Snowdon, who was wear­ing two hats as a life member of the Friends of the National Railway Museum. A selec­tion of pho­to­graphs taken on the day by Peter jack­son are avail­able for view­ing in the Gallery. A Trip to Bletchley Park Near Milton Keynes -26th May 2015. We enjoyed a most suc­cess­ful outing to Bletchley Park where the Nazi and Japanese ciphers were broken during World War II. Visiting coaches must park off site. Setting down and pick up times have to be booked weeks in advance. Our drop off time was 11am requir­ing a 7.30 am depar­ture from Sheffield but as the day brought wall to wall sun­shine our spir­its were high. Whilst Chamberlin’s appease­ment ruled, Alastair Denniston planned for the coming war. He was head of the Government Code and Cypher School and acquired Bletchley Park in 1938. The ini­tial team of less than 10 experts and math­em­aticians where known to Denniston per­son­ally and moved into the main build­ing in 1939. By the end of the War over 9,000 people were based at Bletchley Park. Many of the build­ings sur­round­ing the ori­ginal house have been restored to their war­time state and vis­it­ors wander through these “huts” to view exhib­i­tions and hands on dis­plays that explain the oper­a­tions under taken by each “hut”. Most asso­ci­ate the Park with crack­ing the Enigma machine used by the Germans for its enciphered army, air force and intel­li­gence mes­sages and for cre­at­ing the first modern com­puter to assist this work. In the second half of 1940 an even more com­plex enci­pher­ing machine called the Lorenz was used and the Bletchley team also cracked this. The ori­ginal three rotor Enigma machine was cap­able of 156,000,000,000,000,000,000 pos­sible com­bin­a­tions. It was mar­keted to the bank­ing industry and had been “cracked” by a few bril­liant Polish math­em­aticians. The German mil­it­ary adap­ted this machine and made it more com­plex. The Polish res­ist­ance obtained one of these mil­it­ary enigma machines that was given to the French and then to the British together with their know­ledge. At Bletchley Park the Enigma was cracked and an organ­isa­tion was developed to try to inter­pret the de-ciphered mes­sages. The machine set­tings were changed at mid­night each day and the Bletchley team had to crack the “codes” anew. The vis­itor is taken through all the above and it is enlivened by sound record­ings as well as pho­to­graphs and objects of the time. There is a res­taur­ant as well as coffee shops, a museum with work­ing models, a book­shop and of course toi­lets dotted around the site. It came as a bit of a sur­prise to some of the mem­bers’ wives just how inter­est­ing the Park was to them. The added bonus is that each entry ticket can be reused for entry during the next 12 months. A Visit To The Advanced Manufacturing Research Centre. Approximately 30 mem­bers enjoyed a morn­ing visit to the AMRC wing of the Sheffield University on Wednesday the 11th February. The visit com­menced at 10:15 am with coffee fol­lowed by an intro­duct­ory talk at 10:30 am, and finally a visit to one of the advanced machin­ing labor­at­or­ies on the com­plex. The morn­ing was then roun­ded off with lunch at Whitby’s Fish & Chip Restaurant close by. 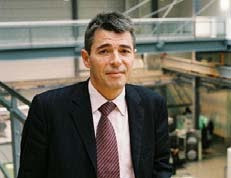 The Advanced Manufacturing Research Centre or AMRC as it is known was estab­lished in 2001 as a £15 mil­lion col­lab­or­a­tion between Sheffield University and aerospace giant, Boeing with sup­port from Yorkshire Forward and the European Regional Development Fund. It was the brain child of Adrian Allen and Professor Keith Ridgeway. Adrian Allen had worked in aerospace for over twenty years, which included owning and man­aging a Sheffield based engin­eer­ing con­sultancy busi­ness. He had developed a new method of machin­ing titanium alloys, used in large quant­it­ies in the air­craft industry. He took his ideas over to Boeing, only to be told that they no longer had their own man­u­fac­tur­ing facil­it­ies, they adop­ted the policy of sub­con­tract­ing everything to highly skilled spe­cial­ist com­pan­ies. They had in fact cre­ated a net­work of sup­pli­ers all over the globe and Adrian was not pre­pared to go globe hop­ping to all the man­u­fac­tur­ers, who might or might not have accep­ted his ideas. 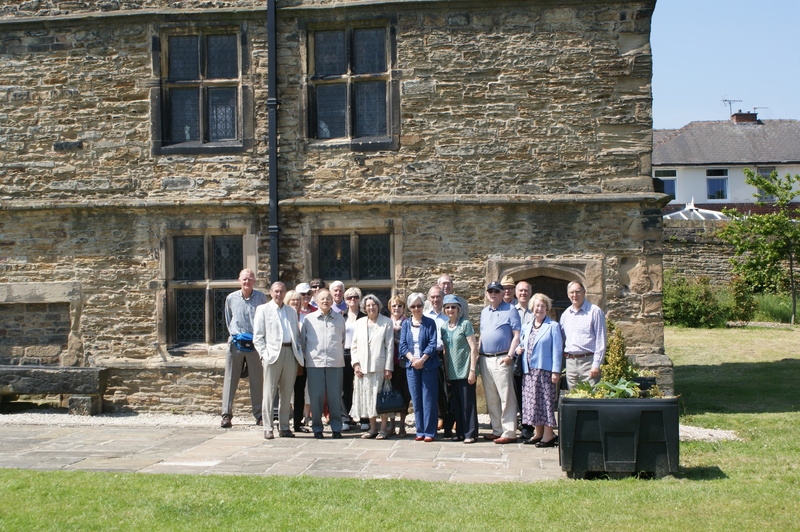 He came back to Sheffield and dis­cussed the situ­ation with Professor Keith Ridgeway. Between them they decided to approach Boeing with the idea of estab­lish­ing a research centre in the UK as part of the Boeing net­work and that it you be based at Orgreave and they would call it South Yorkshire Knowledge Organisation, SYKO for short. Boeing were delighted and agreed to go into part­ner­ship with the organ­isa­tion, but the name had to be changed because SYKO had other con­nota­tions. It was finally agreed that it should be called AMRC and based at Orgreave. In 2004, the AMRC moved into a purpose-built facil­ity as the anchor tenant for the Advanced Manufacturing Park and since then it has gone from strength to strength. The organ­isa­tion is headed by the Sheffield University and Boeing and includes more than 70 fee paying com­pan­ies. The AMRC iden­ti­fies, researches and solves advanced man­u­fac­tur­ing prob­lems and has over 80 highly qual­i­fied research­ers and engin­eers from around the globe. A Visit To The Cutlers’ Hall Sheffield — 12th March 2014. We were told that we were in for a sur­prise but noth­ing could have pre­pared us for what we saw and exper­i­enced. It was tre­mend­ous and if you look at the gal­lery you will see pho­to­graphs of some of the rooms and what they con­tained. We were very for­tu­nate because we not only saw the public rooms and cham­bers but also the private rooms. We met at about 10:15 to 10:30 am for coffee in a recep­tion room on the first floor and our tour began at 11:00 am. We were split into two groups of twelve to fif­teen which meant that we could all hear what our guides were saying. There have been three Cutlers’ Halls built on the same sight: the first being built in 1638 but was found to be inad­equate and this was replaced by a larger build­ing in 1725. Again this was replaced by a new build­ing in 1832 at a cost of £6500.00 which was then exten­ded between 1865 and 1867.The front of the Hall is deceiv­ing because as you enter it is like going into a Tardis: it seems to go on for ever as you go through vari­ous rooms, almost extend­ing to Fargate. The oldest rooms which con­tain the ori­ginal ban­quet­ing hall are to the rear of the com­plex. The Cutlers’ coat of arms can be seen every­where within the build­ing with the motto, “Pour y par­ven­ier a bonne foi.”, which trans­lated means, “To suc­ceed through good faith.” Various depic­tions of ele­phants are also abund­ant although in some cases it is quite evid­ent that the artist had never seen one. The old ban­quet­ing hall is to the rear of the build­ing and has a mag­ni­fi­cent sky­light: it also has a con­cealed door which I found fas­cin­at­ing. In the main hall, used for very grand events in the city, includ­ing enter­tain­ing roy­alty, there are plates on the walls show­ing all the Master Cutlers from 1624 to the present day. There are also sev­eral plates of bene­fact­ors and founders. Flags of all nations ( pos­sibly of the Empire ) used to hang from the walls in this hall but they have been taken down for health and safety reas­ons. When I quer­ied this I was told that they har­bored dust and bac­teria which could fall on the guests eating bellow. Each year from 1648, apart from inter­rup­tions by the World Wars the Master Cutler has held ‘The Cutlers Feast’, a very grand event. Sometimes the ladies have joined the gen­tle­men, but more often than not they have had their own feast in the Hadfield Hall, which is situ­ated below the Main Hall, although it was strenu­ously poin­ted out that this would be the decision of the Mistress Cutler. The ladies would then go upstairs to the ‘Ladies Gallery’ to listen to the speeches, although lat­terly they have watched and listened to them on mon­it­ors in the Hadfield Hall. The walls in all the rooms are dec­or­ated with por­traits of Master Cutlers’, famous places, and famous people. Some rooms and cor­ridors con­tain dis­play cab­in­ets of edge tools con­sist­ing of pen knives, scis­sors, snuffers and cut­lery, includ­ing the Norfolk Knife which was man­u­fac­tured by Joseph Rodgers and Sons at there works on Norfolk Street for the Great Exhibition in 1851. Our tour ended with a visit to the private cham­bers of the Master Cutler and also the cham­bers of the Mistress Cutler. This was cer­tainly a visit which I am pleased that I didn’t miss. 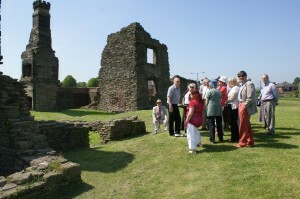 Visit To Cromford Mills & Village — 18 September 2013. As our chair­man said in his note in Stumpers, it was an excel­lent day made all the better by the weather. Some pho­to­graphs of the day can be found in the new Gallery which can be found at the right hand side of the menu bar. More will be added over the coming week. The mills and vil­lage were built by Sir Richard Arkwright, the father of the fact­ory system, mass pro­duc­tion of cotton thread and the shift system. He was 100 years ahead of Henry Ford and his mass pro­duc­tion of the Model ‘T’ Ford car. Arkwright was born in 1732, the son of a tailor. His par­ents couldn’t afford to send him to school and so his cousin Ellen taught him to read and write. He was appren­ticed to a barber and wig maker and during that time he inven­ted a water­proof die for wigs. He had a burn­ing desire to make money and turned his mind to the spin­ning of cotton which was a ‘cot­tage’ industry at that time: the thread being pro­duced by women in their houses. He designed a spin­ning frame based on an earlier idea of Thomas Highs who didn’t have the fin­ances or the under­stand­ing of why his design didn’t func­tion. Arkwright’s frame was first used in Preston in 1768 a midst tre­mend­ous oppos­i­tion from the skilled hand spin­ners who feared he would put them out of busi­ness. In 1769 he moved to Nottingham and teamed up with Jedediah Strutt, who inven­ted the stock­ing frame, and Samuel Need, a wealthy hosiery man­u­fac­turer. In 1769 Arkwright took out a patent for his frame and tried to power it by a horse tread­mill but it was unsuc­cess­ful. Realizing that water power could be the answer he and his part­ners built the first mill,which was five stor­ies high, at Cromford in 1771 where there was a plen­ti­ful supply of water. This came from the Cromford sough, which was a three foot dia­meter drain, built by the lead miners of the area to get rid of the water from the mines. The water from the sough went into a round sluice area, loc­ally known as the ‘bear pit’, because that is what it resembled. The ‘bear pit’ con­tained two sluice gates to either send the water, via an aque­duct to the mill or to a mill pond for stor­age, known as the Greyhound Pond because it is situ­ated behind the Greyhound Hotel. After only a year or so Arkwright exten­ded his first mill by about another 30% to cope with the demand for his cotton thread. Arkwright ran the mill around the clock, oper­at­ing a two, 13 hour shift system: he was the father of the shift system! Within the next year or two he built a second mill which was seven stor­ies high and used the water from the first mill to power this by chan­nel­ling it down a millrace. The mills were heated up to approx­im­ately 30 degrees cen­ti­grade and the floors were kept con­tinu­ally wet to obtain a high humid­ity, the best con­di­tions for spin­ning and work­ing cotton. Work in the mills must have been very unpleas­ant under these con­di­tions, which is prob­ably where the expres­sion of a ‘sweat shop’ came from. He paid his work­ers higher than normal wages for the time. He provided a doctor for ill­ness and acci­dents, and once or twice a year arranged feasts and balls for them. He built ware­houses in front of the mills without win­dows on the ground floor on the out­side walls, partly to store his goods but to also act as a defence against mob attack. It could also be said that he built Cromford Village for his work­ers, includ­ing a market square and streets of houses which his employ­ees rented from him. The houses were built of stone to quite a high stand­ard for the time, and were three stor­ies high. The ground floor was for living in, the first floor was for sleep­ing and the second floor was designed so that the man of the house could have a weav­ing machine. He built two inns in the vil­lage because beer was recog­nized as the only safe liquid to drink. He also built the Greyhound Hotel where his poten­tial cus­tom­ers and cli­ents stayed, and where he con­duc­ted his busi­ness. Although he made a lot of money from the mills he made more money from licens­ing his pat­ents to other busi­ness­men. He built a school for the chil­dren before it became com­puls­ory for them to attend full time edu­ca­tion, prob­ably because he real­ized what he had missed as a boy. Sir Richard Arkwright was mar­ried twice and was knighted for his con­tri­bu­tion to the coun­try. He had a son, who was also called Richard who became a banker as a result of the enorm­ous wealth that his father had accu­mu­lated. He died on the 3rd August 1792 at the age of 59.